This illustrated Travel Guide is a part of the Mobi Sights series, our concise guides that only feature the most essential information on city attractions. This guide is designed for optimal navigation on eReaders, smartphones, and other mobile electronic devices. Inside you will find a locator map and a list of top attractions linked to individual articles. Addresses, telephones, hours of operation and admissions information are included. 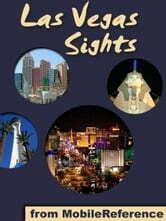 Please search for "Travel Las Vegas," part of the Mobi Travel series, if you are interested in the complete travel guide that includes more maps and attractions with additional articles on history, cultural venues, transportation, districts, dining, accommodations, and more.